The Replacement has this eerie fairy-tale feel. It’s really hard to describe this book, it’s different from the average young-adult novel. I’m having troubles reviewing this book (which is quite rare for me), but I’ll do the best I can. Mackie lives in Gentry with his parents and sister yet he is not their real family. He comes from a place no one talks about. He is something no one talks about. Evil lurks in Gentry, and this time it might get personal. The setting of The Replacement reminds me of a young-adult version of Derry, the town Stephen King has created. It has the same foreboding feel to it, the same sense of evil. And even though everyone feels it, and everyone knows, they don’t move to another town. They are used to the fear. Horror is one of the hardest genres to write in. To make a story truly scary you need more than just some gore and bloodshed. You need true evil, something that sends shivers up your spine. I love how Ms Yovanoff sets the ambience. Although it really isn’t that scary, I refrained from reading this book in bed. I’m very prone to nightmares, and I don’t want to meet any of her monsters in my sleep. In The Replacement it evil isn’t just black and white. It has many shades of grey and the main character’s perception changes throughout the story. Mackie really undergoes a transformation. From a shade of a person that only wants to disappear he turns into someone that looks problems into the eye. To be very honest this was a strange book. At times it felt dreamlike, fairy-tale like while at other times it felt like a contemporary paranormal novel. 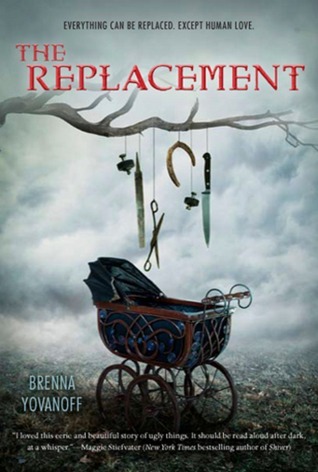 I’m still not sure what to think about The Replacement, and I’m not sure yet whether or not I will read it again. I am curious to maybe read some of Ms Yovanoff’s other works. She has an interesting voice that I would love to see more of.